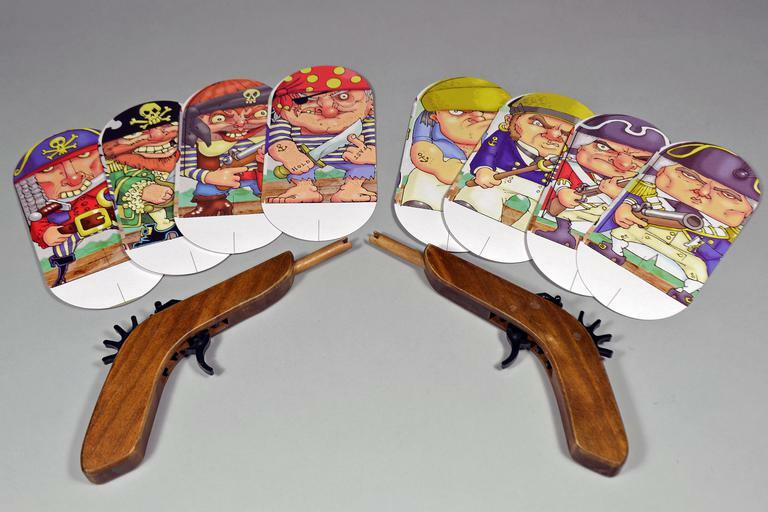 The game references historic conflicts in the early 18th century between 'putrid' pirates and the 'noble' Royal Navy, which is an interesting topic for a toy, as most pirate toys refer to fictionalised battles between pirates or hunts for buried treasure. The pirates are portrayed as villains, which has generally been the case in the longer-tradition of pirates in children’s culture, although a player can choose to be either Navy or pirates, making the goodness or badness of their choice of sides ambiguous. 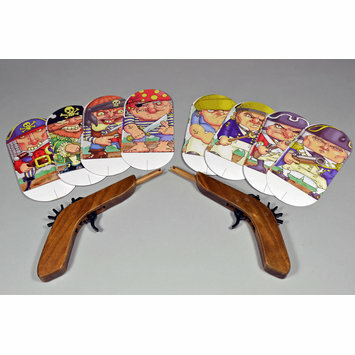 Shooting game consisting of two rubber-band pistols and eight targets, enclosed within a printed card box. The box is printed on its front with an image showing the pirate and navy characters engaged in a battle, the back carries information about the game and images of it. The pistols are made of wood and vaguely resemble flintlocks. The trigger and firing mechanism are made from black plastic. Elastic bands may be hooked over the end of the 'muzzle' and the spoked wheel at the rear, pulling the trigger causes a mechanism to lift the elastic band, freeing it from the wheel, and shooting it toward a target. The colour printed card targets are all pill-shaped when not standing, they have integral stands which fold backwards along perforated lines. 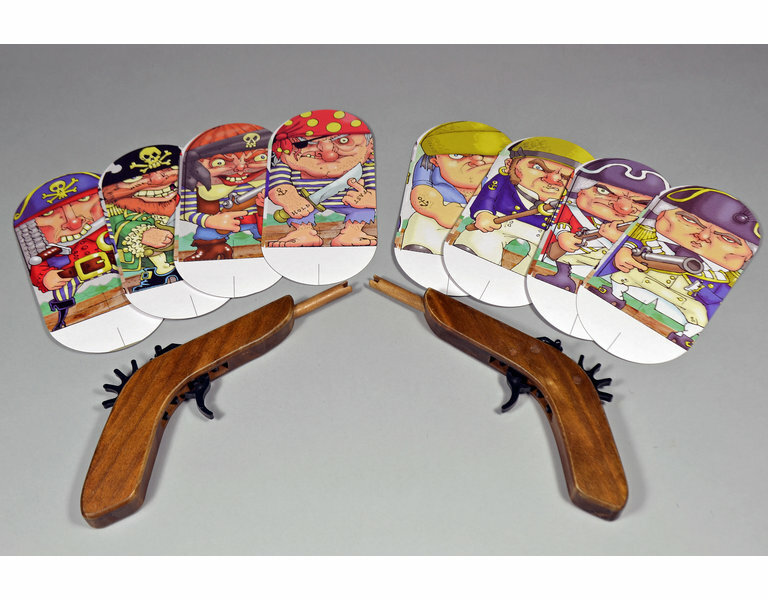 They show four pirates and for Royal Navy characters, carrying weapons and scowling. Shooting games have for decades been popular fairground attractions, with historical roots in contests at local fairs and in informal sporting competitions. Manufactured toy target games to play with at home began to appear in the late nineteenth century; some of them used ‘pop-guns’, others were harmless archery sets. Many target games are themed around hunting, military conflict or characters from popular culture. House of Marbles is a UK-based manufacturer of traditional toys and pastimes, based in Devon.